The owners of the cottage at Rhyd Ddu were clearly fans and supporters of the Ffestiniog and Welsh Highland Railways. 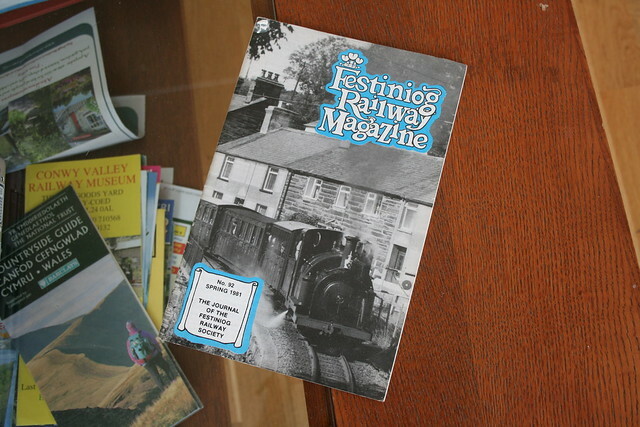 There was a great print of K1 on the wall of the living room, and the traditional holiday cottage bookshelf was also home to a selection of new and old magazines from both lines’ preservation societies. While the pages of the Snowdon Ranger (WHR) were interesting for being able to match the planned and real progress with what we could see out of the windows, it was the older Ffestiniog magazines that really caught my attention. Some predated the return of the railway to Blaenau, and were packed with (now) historical photos and factual nuggets. Others were from around the time of my first trips on the line in 1983 and 1984 and to see the railway at the time from the perspective of those running it was a great contrast with my own childhood memories. The conversational style of the contributors is also vastly preferable to a dry, official history. Reading back though it seemed one thing was for certain: whether preserved or modelled you can pretty much guarantee a narrow gauge railway will always take longer to build than you plan when you set out! This entry was posted in 2' gauge, ffestiniog, narrow gauge, old, welsh highland railway. Bookmark the permalink. I'm very tempted to organise a holiday there next year!